Today we’re going back to the basics, and reviewing how to search for award tickets. I’ll be highlighing AA with this post and showing two ways to search for award flights while specifically excluding carriers you don’t want to fly on. In today’s example we’ll go with one of the toughest AA awards out there; A round trip flight to London from a Mid Size US City. The most difficult part of all award bookings is honing in on an award that balances your dates, your preferred flights and your destinations. 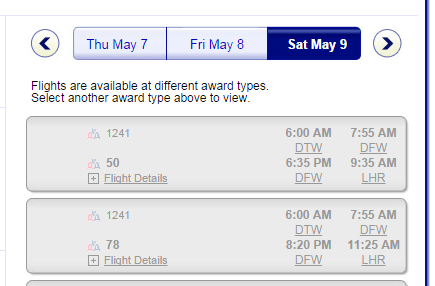 It is nearly impossible to have your ideal choices when it comes to award flights. You’ll need flexiblity in either your dates, your destination or your class of travel/carriers. Today we’ll focus on just one angle of this–preferred flights. There’s a huge difference between using your miles and your miles using you. We’ll review the difference and then step into how to avoid being used. The ultimate example of your miles using you has to be an award flight to Europe on BA Metal. We’ve discussed that all mile bookings have two components, miles and cash. Lets assume you want to go to London, and want to use your AA miles to do so. 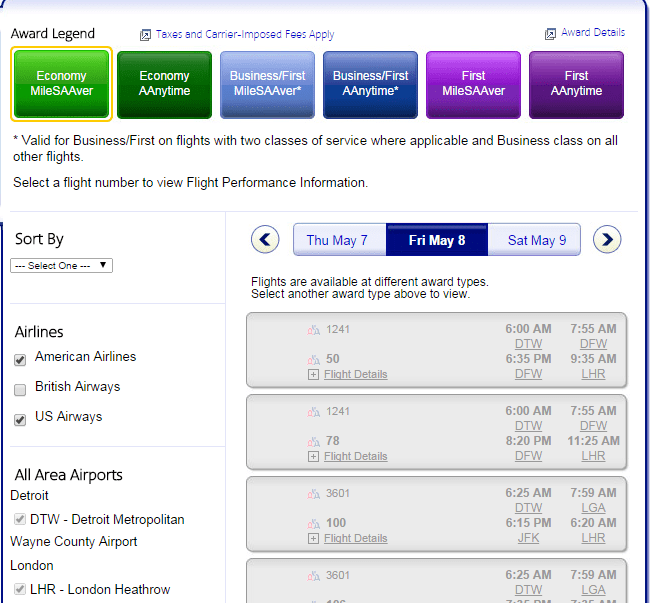 Doing a standard search, DTW-LHR on AA.com returns plenty of options, nearly every single day of the month. There are no statistics on how many flights are redeemed in this way–but I would argue that people do book these crazy flights. 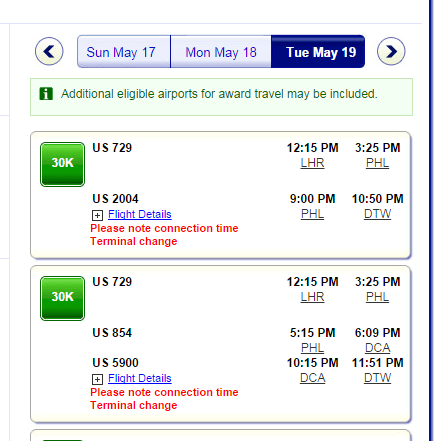 I could see someone calling AA, and pay ing the crazy $700 (plus $75 phone booking fee!) without knowing any better. In the above example your miles are using you; you’re saving just $323 while using your 50,000 miles. That’s less than $.006 per mile. In addition you’re stuck with less than ideal routings. You miles are keeping you on the ground for 4+ hours in each direction, versus short 1:29 and 2:00 connections on the paid ticket. These long layovers eat up whatever remains of the $300 in savings, and at the end of the day you would have been better off simply buying the paid ticket and using your AA miles for anything else–possibly even magazine subscriptions. Or Are You Using your Miles? Keeping in mind that we want to minimize costs, both in Dollars and time we therefore want to restrict our flights to those which have no excessive fees. That means avoiding British Airways whenever possible when booking with AA miles. 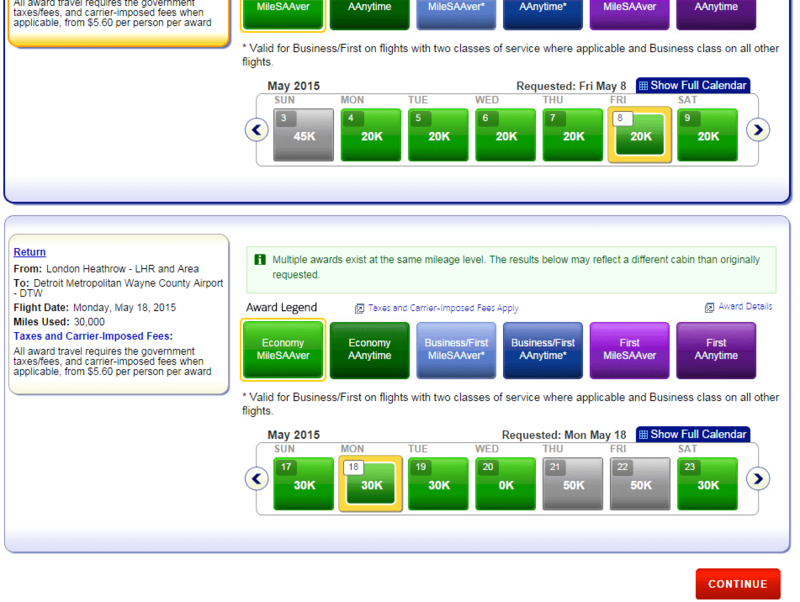 To do so we’ll do one of two things, search for only routes with no BA flights, or exclude BA from our results. We’ve covered routes multiple times here on Milenomics, and using these segment by segment techniques, along with a paper and pen would be a way to avoid BA flights. Searching one flight segment at a time and piecing together your award by hand would also guarantee you see all possible options. Restricting results to exclude a carrier is much easier, and I wanted to go over it here on Milenomics for those of you who don’t care to spend hours searching for an award. The negative of restrictive searching on aa.com is that you cannot see an entire month of options at once like you can with selective routes. You can see 2 weeks at a time, so to see an entire month you’d need to do 2 different searches (more on this later). 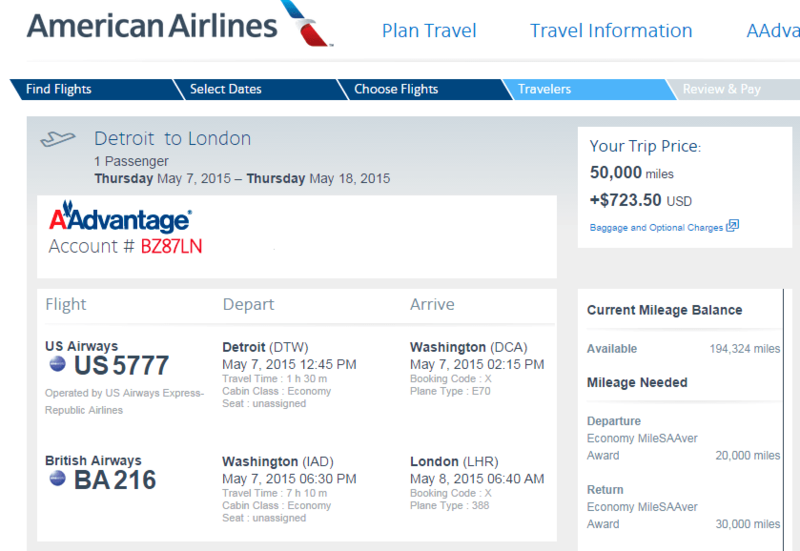 Plug the entire route, DTW-LHR into the AA booking engine, and include your optimum dates. There is a good likelihood these dates won’t work, so be ready with alternatives. 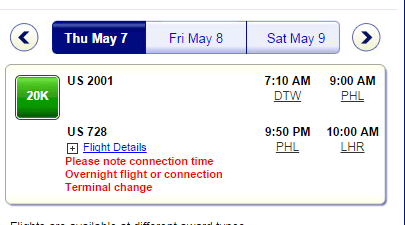 You may notice AA flights here–these are not available as low level options, and are grayed out because of this. Not totally ideal since you’re looking at an early morning flight from DTW and then a 12 hour layover in PHL, but you’re not on BA metal. For this example we’ll stick with this flight. You may want to continue going day by day and see what other options were available. For the return the process is the same, Click on the return flight panel, and then uncheck “British Airways” in the Airlines section. Again, doing so will likely eliminate all possible flights. I wouldn’t actually travel to CDG just to avoid the additional $100. But if you’re considering it, and dates and flights work for you then the extra $100 you save could at least pay for transportation to CDG. Limitations to this Technique: You can only move one week forward or back with this technique, so you can cover a maximum of 15 days. If you reach the end of that 7 days on either side of your preferred date you’ll want to go back and do a new search two weeks earlier or later to cover another full 15 days. Earlier in this post I mentioned that searching segment by segment is a good way to limit the options. I almost always do segment by segment searches when I’m looking for a complex award. Indeed the above search could have been done as JFK/DCA/PHL/CLT/DFW/ORD-LHR to show even fewer options. When doing a more direct search it still makes sense to reduce the number of carriers, as a RDU-LHR search could very well route you to a US hub and then over the Atlantic on British Airways Metal. 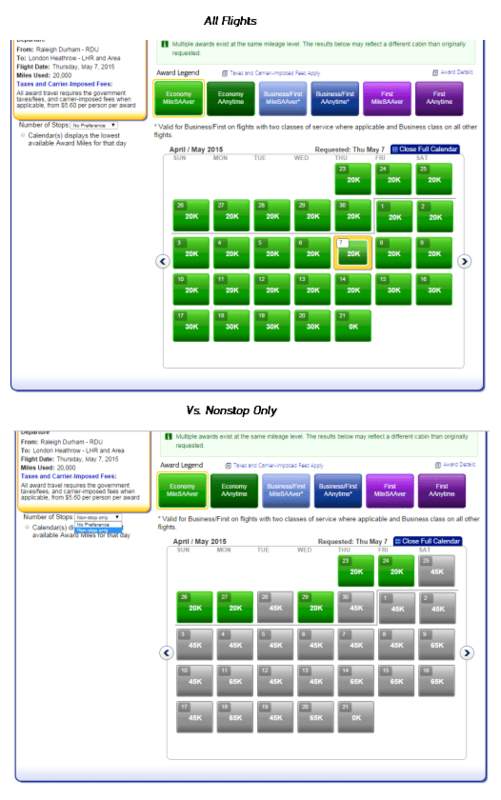 Be sure to select “nonstop flights only” in the dropdown menu on the side. Not doing so will likely mean you are still seeing flights on carriers other than the ones who fly your route nonstop. This type of searching takes much longer than the above example DTW-LHR. This is because even though RDU-LHR is available there may not be a good way to get to RDU from wherever you live. You’ll waste time on searches for options that don’t work and may end up with the same flight options as above. Luckily AA still offers to hold award tickets for free. Use those holds to keep a workable option available while you research other more complicated routes. At the end of the day you’re better off booking a less ideal option sooner rather than waiting to see if something better opens up in the coming weeks/months. Find a good flight option, that works on your dates and book it. This oughtta help TBB out! Nice post Sam. Unchecking BA is a great time saver. You can’t search JL or Cathay or ethiad on AA. You can’t search JL on Qantas. Why isn’t there a host that blocks BA altogether? Saianel: You bring up a very good point, aa.com is by no means a complete search engine. What annoys me as well is that those flights which can’t be booked online will then result in a phone booking fee with AA. These types of issues are what turn a lot of people off to using their miles in the first place.